It’s only racist if Republicans do it; that’s seems to be the ethos of the political left and that of the Democratic Party. 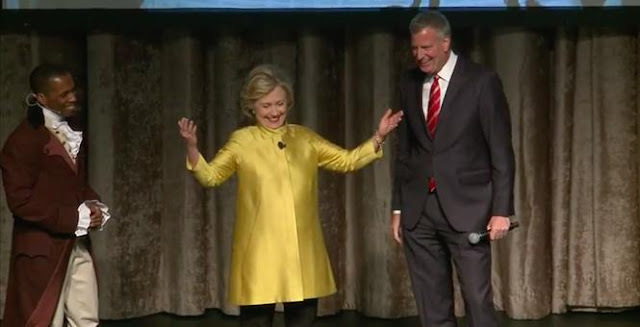 This was showcased yet again, albeit painfully, during the awkward moment when New York City Mayor Bill de Blasio joked about how his late endorsement of Hillary Clinton was on “CP” time during the Inner Circle’s annual musical at the New York Hilton Hotel over the weekend. According to their description on Facebook, The Inner Circle was founded in the early 1920s, which allowed members of the media to poke fun at politics and “hold up a mirror to New York's political elite.” Past mayoral appearances include Michael Bloomberg dressing as a hippie, while Rudy Giuliani showed up in drag. It’s a charity event that saw a guest appearance from Hillary Clinton that led to this rather awkward exchange. "I love this city and that's a fact," the mayor rapped. "But it's like shark week when you reporters attack. I know you're doing your job, so let me do mine. 'Cause I'm BDB, and this is my rhyme." I’ll let you watch the rest of this painful act, but around 7:55 – Hillary appears on stage with Odum and De Blasio. At 8:55 comes the awkward colored people’s time remark. “I just have to say thanks for the endorsement, Bill,” said Clinton. “Took you long enough,” she continued. “Sorry Hillary, I was running on CP time,” replied De Blasio, which did not elicit much laughter from the crowd. “That’s not—I don’t like jokes like that, Bill,” said Odum. The thing is we all know he wasn’t–and it was a stupid joke, especially for someone who is part of the left wing, political correctness charge that’s ruining college and comedy. Yes, Mr. Mayor we all know you have a black wife; a) that doesn’t make you a member of the African American community b) that doesn’t mean you can culturally appropriate the jokes about her culture and race as if they’re your own. Sorry, I’m just going by the progressive playbook on these rules and regulations. here would wall-to-wall media coverage. So, it appears that making politically incorrect, or other racially charged, remarks are just fine, as long as you’re a Democrat, or if you’re “down with the Sandinistas,” in which we have no doubts, Mr. De Blasio.